‘Treasure baskets’ were originally conceived by Elinor Goldschmied, a pioneering early years educator. Through her work with children in Italian orphanages after the Second World War, she observed how even very young babies benefited from unstructured play with natural and simple household objects. Most of us have experienced this ourselves at some point – for example in playing with the saucepans from the kitchen cupboard, or the random collected contents of our parents’ bags and pockets. Goldschmied realised that the different properties of these objects – whether they were smooth or rough, heavy or light, cold, shiny, fragrant and so on – enabled babies to use their senses to explore and discover the world around them, in a way that today’s mostly plastic toys cannot. This type of activity is an example of ‘sensory play’ – play where the main interest and purpose is in engaging one or more of the five senses. Brightly coloured plastic toys can stimulate your baby’s sense of sight, but will usually do little for any of the other senses. Test this out for yourself by gathering some of your child’s plastic toys together, closing your eyes and then exploring these toys the way babies do – with your hands, mouth, tongue, nose and ears… what variety and interest do they offer to your child’s senses of smell, taste, touch or sound? While there are some excellent plastic toys around, limiting your child’s play to only these will limit what they can learn from the world at this early stage in their development. The aim of treasure baskets are to collect together a group of non-toy objects (this is very important) made of or being natural materials (wooden or metal spoons, for instance, or objects such as pinecones or shells). These objects are put into a large, shallow treasure basket that is big and deep enough for the child to have to rummage to discover them all, but not so big as to topple over if the baby leans on it. 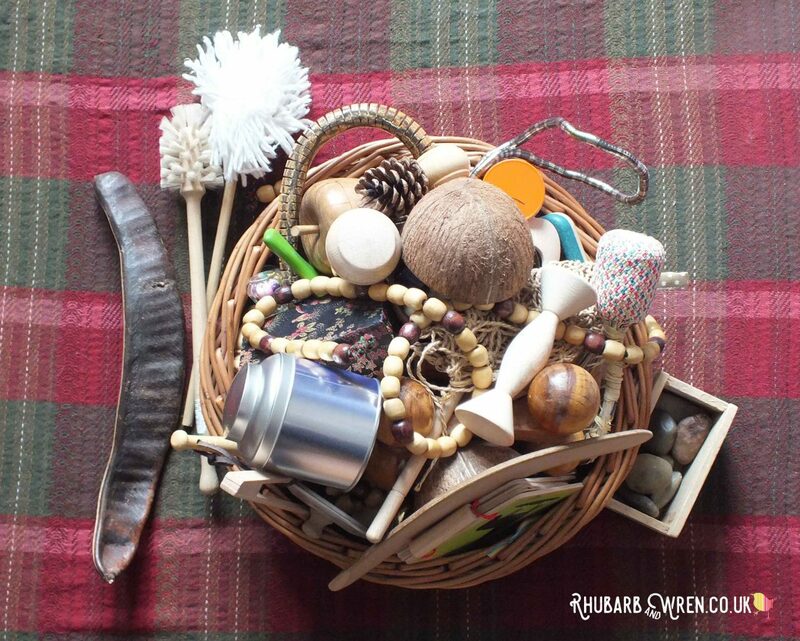 The objects in the basket offer your child a range of sensory experiences, but the act of sorting, choosing, removing and even rejecting and returning items to and from the treasure basket are all just as important learning opportunities here. Goldschmied suggested the ideal treasure basket to be round, about 30cm in diameter and about 10cm deep for this reason. She also suggested the best baskets would be woven willow (or similar) with ridges to provide additional textures for the baby to explore. A simple wire basket filed with wooden objects to explore is as great alternative basket for older babies and toddlers. If you cannot find a basket that fits Goldschmied’s criteria exactly, don’t despair; people use baskets or boxes of all shapes, sizes and materials, as what’s most important is that the baby can reach inside easy and safely, that the treasure basket holds a good amount of items (variety is another key factor), and that everything can be cleaned after use. As always in this kind of play, avoid anything plastic as that would defeat the whole purpose of this activity. All sorts of items can be put into a treasure basket. They should offer your baby a chance to examine and play with an object that would not normally be available to them and is made of a material other than plastic, to provide your baby with as rich and varied a sensory experience as possible. These don’t have to be bought specially – you are more than likely to have a large number of suitable items already, and as long as they are cleanable and don’t pose a safety hazard (choking risk or sharp edges, for instance) then many ordinary household items will do just fine. Here are just a few suggestions to give you an idea of what you could include. Your kitchen drawer is a treasure trove of interesting items for treasure baskets! Look for wooden spoons, slotted spoons, ladles, metal spoons, carved love spoons, whisks, spatulas, tea strainers, chopsticks. Look for anything with interesting texture or shape, though obviously avoid sharp edges or points. Collections of different sizes and materials provide all sorts of play opportunities so think about including a variety of similar objects. Babies love balls – just make sure they are large enough not to be a choking hazard – so avoid marbles or anything small. Good examples are tennis balls, cricket balls, mini football or rugby balls, mirror balls, woven decorative balls, large rubber balls (not plastic! )… Providing a collection of varied balls allows babies to explore not only the properties of spheres (they can roll, they can’t be stacked, they have no edges or sides…), but also different materials will have different textures, temperatures and weights. As my kids got older, I often put together a ‘spherical objects’ treasure basket for them to play with, and it always kept them interested. In toy terms, long and dangly items can present a strangulation risk for young children and so are usually avoided. However as items in treasure baskets are handled by your baby under close supervision, you may want to include some examples of this type of contraband precisely because this may be baby’s only opportunity to examine that fascinating long, velvet ribbon… Look for items such as metal chains (both my children could not get enough of heavy, cold, clinky metal chains), key chains, plug and chain, all types of ribbon, rope, string and wool, scarves, belts, dog collar and lead… Gently intervene if these go around the neck or get tangled, and make sure beads are not on breakable string in case they go in the mouth (I rethread on something like a shoelace to be sure), but otherwise let your baby explore. Don’t forget about the sense of smell. Include fabric pouches full of fragrant herbs like rosemary or lavender or spices like star anise; restuff a beanbag with coffee beans, and put in clean, old cosmetics or food tins that still hold their fragrance (containers for things like coconut oil or tea tend to be good for this). Add a lemon or orange with a few scores in the skin… Stick to simple, natural fragrances though, as perfumes can be an irritant. So you’ve gathered together your ‘treasure’, but how do you know when you’ve got enough? Goldschmied’s research suggested that a large variety of things offers the most interest and so, to start with at least, go for a nice big pile in your treasure basket – how much therefore depends on the size of that and the objects inside, but aim for at least twenty different items. As your baby gets older, the ways in which they use the basket will change, and you can start to do things like themed baskets and smaller, more focused collections, but start off with a random mix to provide maximum interest and variety. Once you’ve assembled your basket of treasure, you are ready to begin. Treasure baskets are best introduced to babies when they are able to sit up, and you should find a time when they are not tired or hungry. Sit you baby next to the treasure basket so that they can reach in easily. Then sit back and let them explore. It’s that simple. It is important that you resist any urge to commentate or ‘help’; just stay close and respond to them when they look to you for approval or comfort. Ideally, babies should be given the opportunity to explore their treasure baskets every day. I used it as an opportunity for a daily dose of quiet time with my babies, where I got to sit back and enjoy a guilt-free cuppa as they rummaged. The best treasure basket is one that’s overflowing with interesting things! Some babies take to treasure baskets straight away, and dive right in with great excitement – my daughter was one of these. My son, however, was the exact opposite and burst into tears after a few minutes the first few times we tried it as he was clearly overwhelmed by the new experience. Don’t be put off if this happens to you – bear in mind that the basket is offering your child a wealth of sensory input in a way that is entirely new to them so of course some children will need to adjust. Just don’t force it, put the basket away and bring it out again the next day and try again. It didn’t take long for my son to get used to his treasure basket, and he was soon rummaging around very happily. You might want to keep the first few sessions fairly short for this reason, and gradually build up session length as your baby gets more comfortable with exploring their basket. A note about safety. Play with everyday non-toy objects has widely recognised benefits for babies and young children, however these kinds of activities should always be closely supervised. Use common sense to decide what you are comfortable letting your child handle, and decide for yourself what could be a hazard. Filling a treasure basket is best done rummaging around your home, but you’ll need to have a container to put it all in! Amazon has some great options, ranging from traditional wicker to woven cotton. Here are a few of my favourites, plus a few bits that will help you start to build your collection. These are affiliate links, which means that if you click through and buy anything, I will receive a small (little bit less than a nugget!) amount towards the running of this website. Thank you so much for your support. This treasure basket is very traditional – pretty much exactly as described by Elinor Goldschmied in her original description in shape, dimensions and materials. All you need to do with this one is fill it with some treasure, and you’re off! Treasure baskets can be bought with contents, like this one. They’re a great way to start a collection, but part of the fun for both parent and child is in finding unique and personal things, so use this as a starting point you can add to. If you want something a little different, the baskets below are examples of alternative treasure baskets that fit the size and shape criteria, but are made of a different material. I would still stick to natural, non-plastic materials if possible though! You can click the picture or text to see these on Amazon if you are considering buying any – as before, these are affiliate links. This 100% <strong>cotton bread basket comes in ‘Rose’ or ‘Mint’ and is fully washable (yay!). Softer than a wicker basket, makes a very pretty alternative. While it’s a little smaller than the ones above, I’d say it’s still just about big enough, and is the perfect height. Another cotton basket alternative, with this choice you get a pack of two! Again, these are soft, light and washable – so easy to care for and great for packing away or using away from home. This wool felt square basket might not be round, but it’s just the right size and you can choose from a rainbow of colours! And being made of such a soft material, those pesky corners won’t be a problem. Ignore the Christmasy contents – wouldn’t this wicker hamper with a lid make a perfect treasure basket? The dimensions are spot on, and having a lid would help keep things tidy and free from dust. Close in appearance to a traditional treasure basket, this lovely Fairtrade basket is woven from Kaisa grass & cotton, and is the perfect size and height for a treasure basket. Or there’s this oval Fairtrade Kasia grass basket, also the perfect dimensions and oval is a great shape for more than one baby to sit at comfortably. This one comes in a range of sizes too – any of which would work as a treasure basket. And finally, a few things to go with your treasure basket! I’ve given this Little Book of Treasure Baskets to countless friends with babies when gifting them a treasure basket, as it’s a short and straightforward introduction to them that includes some handy lists of ideas to get their collection going. An alternative to getting a pre-filled basket, why not look for a set like this of open-ended toys made from natural materials, that can be used in different ways as your child grows? Some of my favourite things to include in a treasure basket are ‘ethinic’ musical instruments made from natural materials, nuts and seeds. There are so many options for this that I’ve listed just a couple. Hand percussion is probably where you’ll find the best bits for babies – and eventually if you pick up enough different kinds, you may find you can recycle your treasure basket into a music basket once your child has outgrown treasure basket play. We did this and that music basket still gets taken down for play all the time. Caxixi, like this great, jingly Caxixi, are woven shakers filled with seeds or bells to give a jingly or soft rattling sound. They’re light enough for babies to pick up easily, have great texture and make noises… Baby heaven!. Or how about a gourd shaker? This round one is so cool – I can see many a baby being completely fascinated by this noisy sphere. This one will intrigue your baby no end! A giant seed pod sewn shut with the seeds rattling inside… We have one that my sister brought back from Jamaica, where she found it on the ground. If you can’t get to Jamaica yourself (chance would be a fine thing! ), Amazon have you sorted. Forget plastic rainsticks – this one is made from catucs! Much more tactile, and with a great origin story (catus deadwood collected by mule from hills high inland in the Atacama region of Chile) that will fascinate your kids as they get older. I hope that gets you off to an exiting start with your treasure basket! If you are looking for more inspiration, check out my dedicated Treasure Baskets board on Pinterest, where I have loads more ideas.